The 2016 Dakar Rally started with a long applause to Marc Coma, the new Sports Director of the South American African Rally. The 354 competitors (143 bikes, 46 quads, 110 cars and 55 trucks) gathered for the drivers briefing welcomed the five time Dakar winner in the best possible way, feeling reassured and represented by the former Spanish rider. “The rally will see an increase of difficulties day after day, so I recommend to start with calm, especially in the prologue and the first stages”, said Coma, “according to the weather forecast we expect some heavy rain for the first days, so we are monitoring the critical areas, especially the river crossings. A plan B is already in place so there is no need to worry. We may also meet rain in Bolivia, while the current temperatures in Fiambala are around 60 degrees”. The Prologue was long enough to separate the competitors into a logical starting order for the first day of true competition that tomorrow will bring the competitors from Rosario to Villa Carlos Paz, 227 km of timed section and 405 km of liaison. Started in reverse order, Joan Barreda (Honda) posted a time of 6'27", tied with Ruben Faria's (Husqvarna), followed by the Yamahas of Helder Rodrigues (6’30”) and Adrien van Beveren (6’31”), while Michael Metge on a Honda (6’35”) completed the top five. It was an unlucky start for Paulo Gonçalves. A series of mechanical problems forced the Honda guy to make several stops, pushing him to fiftieth place, one minute behind Barreda. KTM Matthias Walkner fifteenth at 17”. Toby Price, sixteenth at 18" from the winner, also had a lacklustre start. 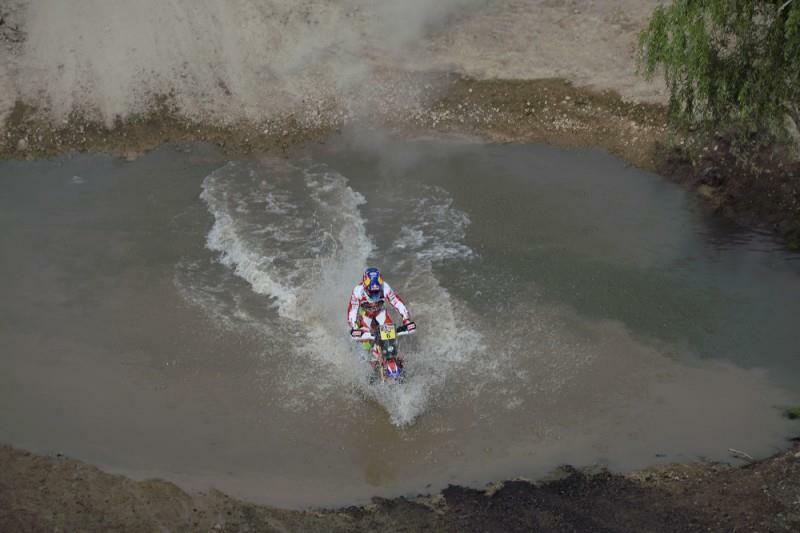 Frenchmen Pierre Alexandre Renet and Antoine Meo took it easy in their first Dakar special, finishing 119th and 106th, respectively. Their fellow countryman Adrien Van Beveren pulled off an awesome performance in his first Dakar special, holding the best time for quite a while and finishing eighth in the stage. Joan Barreda (Honda HRC Rally Team): “I’m happy to start with this result. I’m confident with the navigation. In the last two Dakar Rallies we have been very close to the win. This is my third attempt with the Honda factory team and I am really confident that we can do well”. British rider Chris Cork picked up 25 places in the prologue to move up to 1 91st place starting position for the opening stage on Sunday. Fellow Brit Jamie Smith concluded the prologue.